After a week of presentations, information booths, and a panel discussion, Rocky Vista University wrapped up its annual Violence Education and Prevention (VEP) campaign. Created by the RVU Safety and Security Department, VEP is in its fifth year and serves as an informal but valuable way of bringing the topics of domestic violence, sexual assault, and stalking into the mainstream at the University. VEP also provides additional information for students from the perspective of a physician and the support and resources they can offer their future patients. 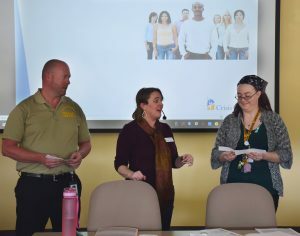 The event kicked off with a presentation on March 11th by Amy McCandless, Development Director from the Crisis Center. During the event, she spoke about the cycle of abuse and why it is so difficult for victims to break free of it, including cultural barriers and system constraints. Ms. McCandless also shared statistics that highlighted the direct correlation between domestic violence and child abuse. The presentation concluded with information on how physicians can provide support and resources for victims of domestic violence, such as asking important questions during the patient intake process and becoming familiar with the Adverse Childhood Experiences (ACE’s) study. During the week, the VEP campaign showcased colorful displays with information materials, treats and giveaways placed at the school’s main entrances. Students and RVU employees were also given the opportunity to share their thoughts using prompts which were displayed on posters around campus. 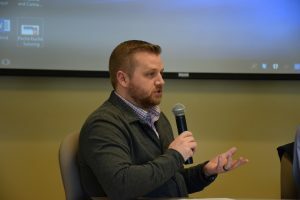 The series concluded on March 15th with a panel discussion pertaining to domestic violence, sexual assault, and stalking. Matt McMaster, OMS-II, and Kade Rucker, NCC, LPCC, Counselor, were once again on the panel as moderator and guest speaker, respectively. Joining them were Jennifer Roger-Flynn, Victims Advocate with the Parker Police Department, and Dr. Deb Stasio, psychologist. During the panel, they answered questions about the long-term effects of violence on victims, why some choose not to report, and the services and resources available to survivors in the Parker community. The campaign proved to be a successful introduction and refresher course on the sensitive subjects of domestic violence and sexual assault, especially during a time when many want to help victims but do not know how. The most notable takeaway for many was the importance of understanding the local resources available and making sure survivors have access to them. For students entering the healthcare profession, meticulously documenting evidence and asking patients face-to-face if they feel safe at home are important tools in reducing domestic and sexual violence incidents. The goal of the VEP campaign is to continue to promote these tools and resources to bring the world one step closer to eradicating domestic violence and sexual assault.